Fidelity Corporate Services Ltd is a privately held BVI company. It is licensed under the BVI Banks and Trust Companies Act 1990 and holds a General Trust Licence No GTL 14006/06, being authorized to provide offshore company formation and management services in the British Virgin Islands. As such, it is regulated and supervised by the BVI Financial Services Commission. The firm has a paid-up capital of USD 250,000 and maintains an adequate professional indemnity insurance coverage. The principals and the management team of the company have passed stringent vetting by the Financial Services Commission as regards their professional compence, experience and personal integrity. Fidelity Corporate Services Ltd specializes in the BVI offshore products and services - primarily the BVI Business Companies, which are more commonly known as IBC's or International Business Companies. We provide offshore company formation and administration, registered agent and registered address services, directorship and company management services, shareholders' services and custody of documents, mail forwarding, virtual office and secretarial services, bank account introductions and management, corporate searches and filings, drafting of corporate and business documentation. Fidelity Corporate Services (Seychelles) Ltd - Seychelles. Located in Victoria, Seychelles, licensed by the Seychelles International Business Authority, specialized in Seychelles IBC, Trust and Special License Company formations. 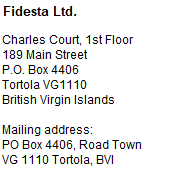 Fidelity Corporate Services Ltd - British Virgin Islands. Located in Road Town, BVI, licensed by the BVI Financial Services Commission and specialized in BVI offshore company registration and management, as well as in the formation and licensing of offshore mutual funds in the British Virgin Islands. Fidelity Overseas Ltd - Belize. Located in Belize City, Belize, licensed by the Belize International Financial Services Commission and specialized in the Belize IBC formations and management, Trust establishment and license applications for financial services companies. Fidelity Corporate Services EU representative office. Located in Riga, Latvia, provides technical, IT and logistics support to other group offices. Since 1998 we have provided thousands of offshore incorporations for professional and individual clients, worldwide. Our group offices assist and complement each other, striving to provide the most flexible and balanced offshore solutions for our clients.